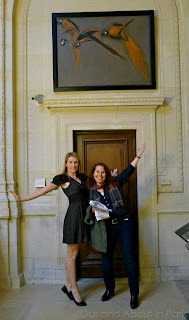 Hunting for treasure with THATLou - the most entertaining way to visit the Louvre! "Finding Noon" and "Une Femme" with our tools, a map and an information packet. Your mission, should you choose to accept, is a treasure hunt for bloggers at the Louvre, the world's most visited museum. Out of the 35,000 works of art on display, your team must locate and photograph team members with as many of the designated treasures as possible within the allotted amount of time. While the subject of the search, "Angels and Wings", may make your heart flutter with delight, please be advised that there are certain restrictions. Team members must stay within three meters of each other and may not ask for external help. Everyone must return to the pre-arranged point at the specified time or lose some of their hard-earned points. Let's synchronize our watches and get started! Even though Daisy didn't really send us a Mission Impossible style letter and the soundtrack of Raiders of the Lost Ark wasn't playing in the background when we arrived at the Louvre, adrenalin was pumping through our veins as we rapidly scanned the information package and made our way to the 17th Century Flemish paintings. Worth 80 out of a possible 1,000 points, Peter Boel's Study of Parakeets was the first treasure that we unearthed on Friday evening. The elusive Eagles Attacking Ducks proved to be more of a challenge and "Une Femme" and "Finding Noon" were thrilled when we finally found it. The scavenger hunt, which had five teams of Parisian bloggers scurrying from ancient Egyptian artifacts to neoclassical statues, was the most fun that I've had at the Louvre...ever. And best of all, I discovered parts of the museum that were previously unknown to me and learned some art history in the process. THATLou treasure hunts are perfect for visitors to Paris, families, birthday parties, corporate-team building and bloggers. Many thanks to Daisy for organizing this entertaining event! In between sipping deconstructed martinis [cocktails] and tallying our points with the other bloggers at the Why Paris bar, we all agreed that she has come up with a delightful idea. For a limited time, THATLou is offering an introductory rate of 18 euros per person, which includes the treasure hunt and a drink at a nearby bar. Louvre tickets must be purchased separately. Please click here to visit THATLou's website and join the fun! The theme for this Sunday is Fish + H20 for Poisson d'Avril (April Fool's Day). Be forewarned: I'm sure that Daisy has a couple of tricks up her sleeve. Finding Noon and Une Femme, If the hunt included points for the most creative poses, we would have definitely received the award for first place. As it was, we made a great team! Still smiling! Finding Noon and Une Femme in front of our last discovery, the sarcophagus of Ramesses III. Une Femme's tweets tracked our progress throughout the treasure hunt as we raced to the finish line. Yessss! I've been waiting for this post like I've been waiting for my American delivery of US Weekly with a pregnant Snooki on the cover (which means I really wanted to read this). You guys are awesome, I love the photos (nice Egyptian, K!)!! It looks like you all had a great time. What a darling idea, THATLou is. So who won? I have yet to figure that out. LOL! I can't tell you how honored I feel to be in the same category as pregnant Snooki! What's even more amazing about K and S's Egyptian poses is that we were worn out by the time that we finally found the sarcophagus but you'd never know it by the smiles on their faces! Plus, in the heat of the chase, I kept forgetting to take the lens cap off of my camera (oops!) so they had to hold their poses until I got organized! Those dance classes in the Marais are paying off because K had perfect form throughout the entire evening. I just wish that you would have been able to join us. We missed you!!! If you would have been with us, perhaps we would have won. As it was, we came in a close second for both the "most points" and the "most tweets" awards. First prize went to Melanie Vaz and Thibault Devillers, the only 2-person team. Second prize, for the team who tweeted the most, went to Emma Bentley, Karin Bates Prescott, Alisa Morov and Rachel. Yes, I'm sorry you weren't able to join as well, as I'd love to have met you and Paris Weekender. Out and About, Une Femme and Finding Noon did marvelously, with only a few points from being first on both prize fronts. Please be in touch if you'd like to go on any of the future hunts, we have three planned for April. Now I must inquire, what is a deconstructed martini? I'll have to go see if I can find it at Why Paris bar. I wonder if it's a shot of gin followed by a smaller shot of vermouth. Maybe Grant Achatz has done one at The Aviary and I'm just not aware of it. Do they organize treasure hunts at one of the museums in Chicago? My daughter has great memories of a nighttime event organized by Northwestern at the Fields Museum of Natural History. As for the poses, I think that they should be mandatory if for no other reason than that it's more fun for the photographer! I had to go back and edit "martini" because it should have been deconstructed cocktails. The blogger who selected the bar is 52 Martinis so I had "martini" on my mind while writing that sentence. As for deconstructed cocktails, I tried the "Why Paris Royal" which was rose champagne with fresh raspberry coulis, lime, mint and cherry liquor. The raspberry coulis was in a tiny glass sitting with the rest of the drink in a martini glass. The idea was to have a spoon of the coulis mixture followed by a sip of champagne. Sorry for the mixup! Yes, I think the poses should be mandatory as well - they're such fun. I'll mention this on Sunday. And apologies for the deconstructed cocktails or martinis (of which there were both), which was probably my mix up. I bet there are some fun treasure hunts in Chicago. 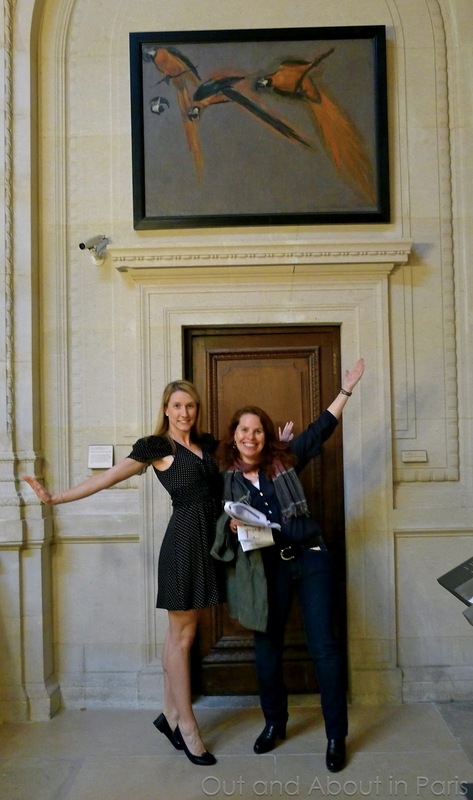 What a fun way to visit the Louvre! As an art "Pleb" I have always found the Louvre overwhelming but I just might try this for a bit of self education. Looks like a really fun day. I am also interested in a "deconstructed martini"? Bottle of gin? or just an olive on a stick? LOL! As I only know my way around one part of the Louvre and always manage to get confused in the other parts, I was pleasantly surprised by how well we navigated the museum. It was a tremendous help that Finding Noon is good at reading maps and did a wonderful job leading us from sculptures to ancient antiquities. Daisy gave us some interesting art history information about the "treasures" that we were supposed to find so I plan to return to the Louvre with her notes and spend some more time looking at the items. The treasure hunts are loads of fun - just be sure to wear comfortable shoes because there's a lot of walking/running. My mistake about "deconstructed martinis" seems to have caught everyone's attention. I suppose that's the result of being a wine drinker! I should have said "deconstructed cocktails". For more info, please see what I wrote in response to Joseph. Sorry for the confusion! So glad you're interested! 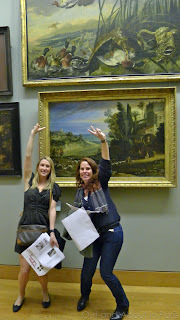 It's a great way to see that the Louvre is manageable, and is a fun method to getting an overview... But it's a treasure hunt, a game: you can't really learn anything within the time frame. Disclaimers aside, I do hope join soon! Each one has a different theme and covers different art. Let me know if you go back with the manual, would love to hear your thoughts (and any suggestions for how to improve the write ups). Oh, Mary Kay, I am so slow on the internet front, but what a true pleasure it is to read your post (both last night in print and today before me). Not only is the writing snappy, fast and fun (I read, of course, with the soundtrack of Mission Impossible in my mind, just as the three of you played it to the same beat), but the photos are just FANTASTIC! Too funny that they had to hold the poses for a while -- one would never guessed from the energy abounding and Finding Noon and Une Femme's fresh smiles. Hope it's alright if I answer some of your visitors, too. (I hope I'm not crossing any blogging etiquette - and please let me know if so). Glad you enjoyed the photos. As you can tell, we had a fantastic time. I'll be sure to send some of the pics to you. Thanks for answering the comments. It's definitely not a violation of blogging etiquette. To the contrary, I'm grateful that you took the time and that people were able to "meet" you. Best wishes for THATLou. I wish you lots of success with this exciting venture. Great post MK! At first I thought the letter at the beginning really came from Daisy and then I realized...hah. I had such fun with you & Finding Noon during this event!! here's to many more fun events in the future! Thanks, Kristen! I can't wait to read your article about THATLou in The Girls' Guide to Paris. Please let me know when it's published so that I can include a link. 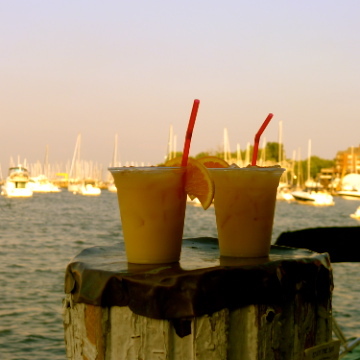 Cheers - to many more fun events in the future! Yes, me too, pretty please. And by the way both the dress and the repetto slippers were divine hunting wear! How fun! I would have totally lost because I'm so slow, but it would help me explore unfamiliar parts of the Louvre. Love the poses, ladies! And the deconstructed cocktails sound delish! Discovering new parts of the Louvre was one of the highlights of the evening. As for speed, we didn't really go that fast (take a look at Looking for Noon's heels!) but we moved with a purpose. Plus, staying within 3 meters of each other was a real challenge. Sometimes we would momentarily forget about it and start to spread out before remembering that we had to stay next to each other. And even though I don't normally drink cocktails, this one was delicious. I would definitely go back for another. Any idea if they do treasure hunts at the Met? They do, but I've never done one before. I did a quick google search and some of the titles I came across are "Art of Darkness," "Naked at the Met," and "Murder Mystery." Sounds like fun, makes me wanna do one! Thanks for doing the google search! They all sound tempting - please let me know if you do one! All of the former NYers currently living in Paris always say that Paris needs more cocktail bars so I'm sure that you won't have a problem deciding where to go for drinks in NYC after a treasure hunt. I have just stumbled across your blog- fantastic! Even more so because I am due to fly into Paris in less than two weeks. Thankyou for some very interesting and entertaining reading. Claire Jones, Melbourne, Australia. Thanks for your kind comment, Claire! It's always exciting to plan a trip to Paris, especially when it's less than two weeks away. I hope that the weather is as beautiful while you're here as it is right now. Best wishes for a wonderful time in Paris!